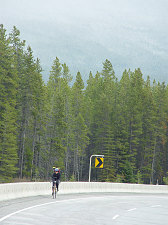 The Golden Triangle is a 330+ km cycle loop through the Rockies. 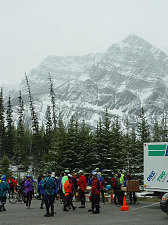 This year, the route went from Castle Mountain Junction, in Alberta, to Radium, BC. 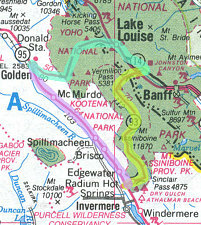 Then, from Radium, BC to Golden BC, and from there back to Castle Mountain Junction. 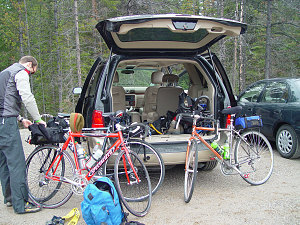 I had done this ride with Lorraine two years ago (see here for that trip report) and enjoyed it immensely, and so I wanted to do it again. This time, I managed to drag along Graham and Caroline with me. Yellow Highlight = Day 1; Purple Highlight = Day 2; Blue-green highlight = Day 3. 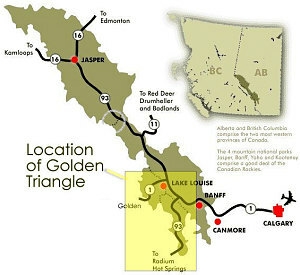 The Golden triangle is run clockwise on even-numbered years, and counter-clockwise in odd-numbered years. (although this alternation may be altered in the future). 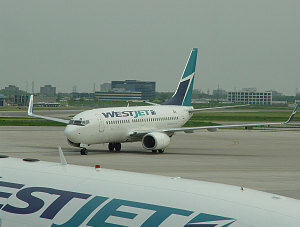 If you are non-local, and need to fly to the Golden Triangle from afar, then your best best is through Calgary. You'll also need to get your bike boxed up properly. 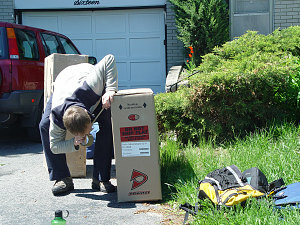 We went to a local bike shop and procured some surplus bike shipping boxes. Be careful when you pack your bike - cushion all sharp edges that might punch through the box. 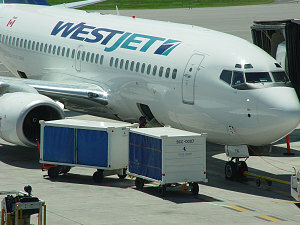 We selected Westjet as our carrier, and they charged $30CDN + taxes to transport the bike (one way). Caroline had relatives that graciously put us up for the night that we arrived and the night that we left. 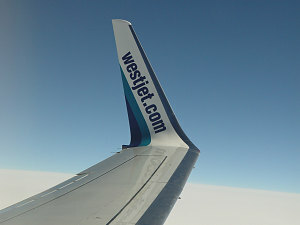 It is possible to arrive in Calgary on an evening flight and still make it to the ride the next morning. 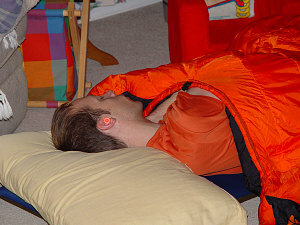 Just expect a short night's sleep! Oh, and by the way, there is no need to bring a stove if you are a coffee addict - on the Golden Triangle your caffeine needs are taken care of! 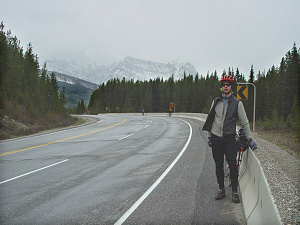 The weather forecast for the 3 days of the tour was horrible: there was a heavy snowfall warning for Banff National Park for Saturday, and Sunday and Monday were forecast to be mostly rainy. We half-considered not even bothering to go to the ride. But, just in case, we got up made our way west. 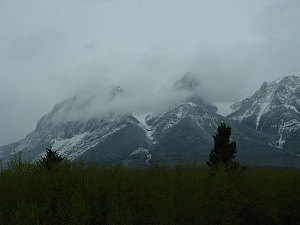 The weather was drizzly and turned to ice pellets and snow as we neared the mountains. It was not looking good, but we had to go and have a look, in any case. 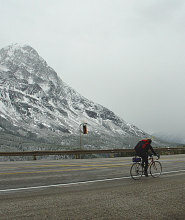 By some incredible luck, soon after the township of Banff the rain and snow stopped and road dried out! amazing - this flew right in the face of the forecast! 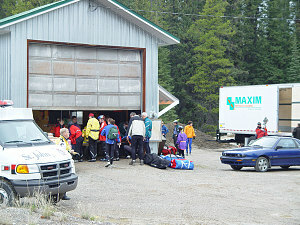 When we arrived at the gravel pit where the ride starts, it was mostly dry (although still overcast). At this point we were very grateful for this. Somehow Caroline's registration had not gone through and she was un-registered for the ride! We managed to scrounge up ninety bucks (about half the registration fee), which one of the EVCC officials accepted (and Caroline would pay the balance later). 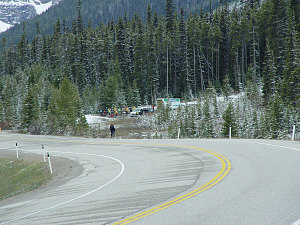 The ride started out on semi-damp roads and there was a dusting of snow near Vermillion Pass. Also it was somewhat chilly (single digit temps). But overall pretty reasonable. We figured if we could just get over the pass and down to lower elevations, we'd be even more likely to avoid the bad weather. The first snack break was soon upon us. 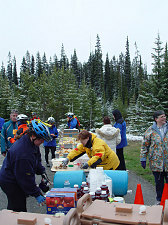 An EVCC GT snack stop is a very nice affair, with lots of goodies including some nice warm beverages (which was very nice on a chilly morning like this one). 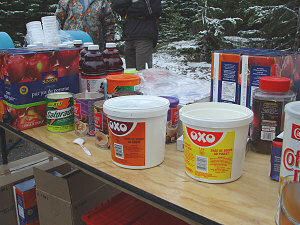 They even had some hot soup mix (and lots of hot water).